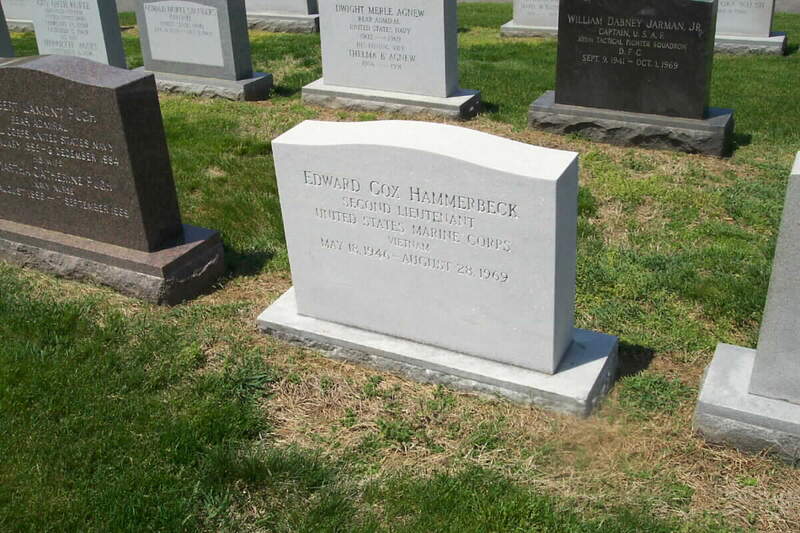 Circumstances of Death: Second Lieutenant Hammerbeck, USMC, 23, was killed in action on August 28, 1969. He was killed instantly by an RPG round while checking the night defensive position of his platoon in the Republic of Vietnam. He was serving as a platoon leader in the Third Marine Division near Cam Lo, South Vietnam. He is buried in Arlington National Cemetery. Second Lieutenant Hammerbeck served as battalion commander of the NROTC unit. He was a Dean's List student and served as president of both military honor societies at the Univerity of North Carolina - the Semper Fidelis Society and the Scabbard and Blade. Upon commissioning Basic School at Quantico, Virginia. Additional training John F. Kennedy Special Warfare School at Fort Bragg, North Carolina. He was the honor graduate of the Psychological Operations Staff Officers Course. Last Duty Station Platoon Leader, Third Marine Division.